Polls haven't moved much over the last week. At least not the average. Let's face it, except for the first few days, this has been a fairly boring election as far as polls are concerned (or for out of province neutrals like me). With that said, the latest numbers from Abacus were showing a much different race with the NDP just 1 point behind the PC. Beyond the horse race numbers, Abacus has been doing an excellent job at providing a better insight into this campaign (if you want deeper polls, Abacus and Innovative have been the best so far). One of the points of David Coletto, Abacus' CEO, is that the NDP can indeed win. In this post, I'll argue that while this is true, this isn't something new. The NDP has always had a high ceiling. Before going further however, here below are the most up to date projections. They are based on the polls published up to Monday evening. That includes naturally the above mentioned Abacus poll as well as others, such as the most recent numbers from the Mainstreet daily tracker. The riding by riding projections can be found at the end of this article. Nothing really different from last week. The NDP isn't rising anymore, at least not if we use the average of recent polls. The PC is stable after having dipped slightly below 40% while the Liberals are surprisingly resilient at around 23-25%. With that said, the projected seat total for the Tories keeps decreasing and is possibly getting close to a situation where a majority would be far from guaranteed. Right now, the odds of a PC majority are around 80%. It mostly depends on the GTA. 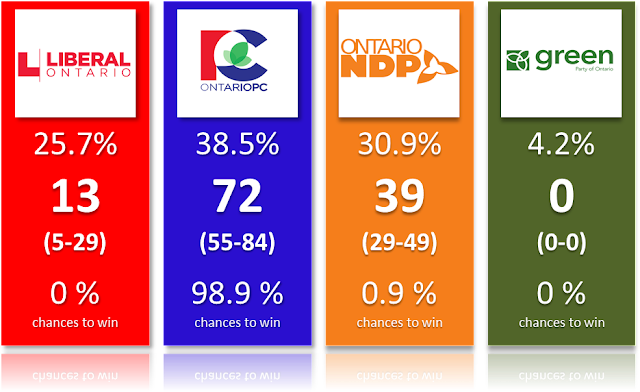 If the polls are right and Ford is leading in both the 416 and 905, then a majority is highly likely (close to 100% really). But there is no denying that we have moved from a situation of a potential super majority for the PC to one where a minority is far from impossible (and would open a can of worms depending on the actual results). Please remember that my model does account for the regional polling average but doesn't use it directly. If I were, the Liberals would be lower and the PC higher. Just mentioning it so that you can compare projections and understand them better. Alright, back to the main topic of the day: can the NDP win? The projections above are indicating that yes, it's possible, albeit unlikely. But that isn't what David Coletto was really referring to. He was mostly talking about how the NDP has a high vote ceiling. Look at the graph below showing a ceiling of accessible voters of 67%! This is higher than any of the other parties. Andrea Horwath, the leader of the Ontario NDP, is also the most popular of the three leaders and the one with, by far, the lowest percentage of people disliking her (she does have a ton of "neutral" and "don't know" though). In an election whose main theme is clearly "change", and where the leader of the current top party is highly divisive, this should naturally put the NDP in a good position. I am not disagreeing with Abacus and Coletto here. I think their top line numbers are a little bit off compared to the average but everything else makes sense. What I'm arguing however is whether having a high ceiling is really such a good thing. On one hand you can see it as a positive since many people are willing to vote for you. On the other, it means a small percentage of these people are actually currently voting for you! Using only the numbers from Abacus, it means Ford is currently convincing 65% of his potential voters to support him and his party. The Liberals have a conversion rate of 57% and the NDP only 51%. See, the thing on election day is that you don't win seats based on potential voters but as a function of actual votes cast for you! The NDP has a structural problem at converting potential support into actual votes. As a reminder, the Liberals ultimately got 37.7% of the vote, the PC 35.5% and the NDP 22.7%. The same poll, when asking the traditional question "who would you vote for?" had 38-36-23, so the poll was accurate. As you can see, there were a lot of people already saying they could vote NDP. But few, relatively, who did. In the survey, respondents were asked to rate, on a scale from 1 to 10, how likely they'd be to vote for each party. What was obvious was that the same likelihood for two parties didn't really mean the same thing. For instance, among the people who were saying 6 (out of 10) for the Liberals, 55% would also choose the Liberals in the more traditional "who would you vote for?" question. On the other hand, only 26% of the 6s for the NDP would be converted in the traditional question. The NDP had a lower conversion rate at every likelihood level. The NDP therefore ultimately scored at the bottom of its range while the Liberals and PC were at the top. It finished distant third when, looking at the potential, it could actually have finished first! Let's be clear here, I'm not saying the situation in 2011 was identical to the one now. The NDP was clearly the third party back then and didn't have much chance of winning, it was simply an unlikely possibility. But it already had a relatively high ceiling, one that was much higher than its actual share of votes. The current situation is qualitatively similar with the NDP having a high ceiling (much higher though) but a relatively low conversion rate. The challenge for the NDP is to finally turn more of these potential voters into actual ones. The recent Abacus poll was showing interesting stuff. For instance, voters would support the NDP more after being told this party was actually ahead of the Liberals (and therefore had a better chance to beat the Tories). The problem is it's easy to inform a few hundreds respondents to a survey, it's harder to let the entire province know. Remember, people like you, reading my blog, aren't really representative of the average voter. This is why Horwath is trying so hard to tell voters it's between her and Doug Ford. So we'll see if the NDP can climb higher in the next two weeks. The potential is there, now it's up to this party to convert. The NDP can not only go and get votes from the other two parties (mainly the Liberals), but it also has to make sure it gets its fair share of the roughly 10% of undecided voters.